Hire Multichain Blockchain Developer Need Help with Private Blockchains? The blockchain is the major game changer of the commercial sphere. It is known for its capacity to establish decentralized networks. However, the nature of various enterprises demands limited access. Multichain is one of the platforms on which Blockchain can operate on and it advocates the creation of permissioned networks. Hire multichain blockchain developer to create a private Blockchain network for merchandise. SHAMLA TECH specializes in enterprise Blockchain development and provides seamless Blockchain solutions for various industries including supply chain, logistics, e-commerce, telecom and healthcare. Hire multichain blockchain developer with us to create private Blockchain networks with a robust base. Multichain is an open source Blockchain platform that facilitates the creation and deployment of private Blockchain networks. The private network may connect the nodes within an organization or multiple organizations. Multichain Blockchain is an advanced version of Bitcoin Blockchain. The difference is that the Bitcoin Blockchain supports public transactions whereas Multichain allows specific transactions. When hiring multichain Blockchain Developer go by the following strategy. Carefully handpick the Blockchain developers of your choice. Go for one to one communication with them to assess their field expertise. Make the right choice and Hire multichain Blockchain Developer for expert help throughout your Blockchain project. Always have a keen eye for quality driven results. As a Multichain blockchain Development Company, SHAMLA TECH guarantees quality services that fetch desired multichain Blockchain outcomes. We provide full-fledged services for Blockchain development with a team of zealous developers. 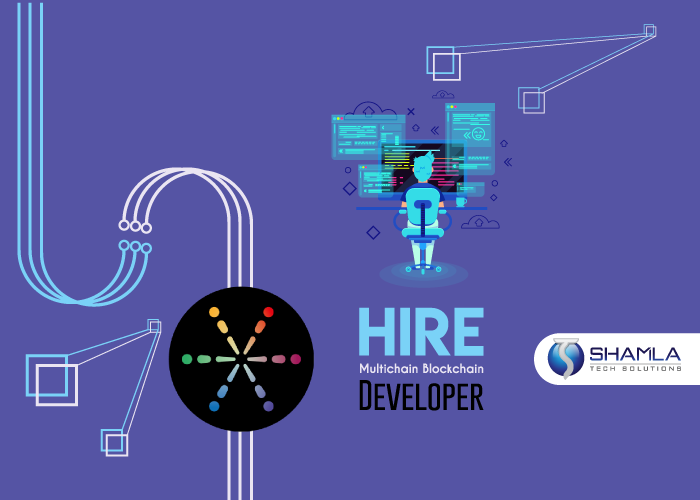 Hire multichain Blockchain Developer with us to avail personalized Blockchain solutions at the best. Our Blockchain services are highly client-centric that our clients gladly get back to us for a second time.